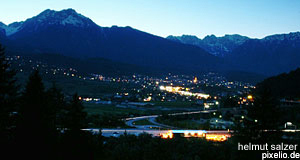 Imst is a town of less than 10,000 residents and located in the upper Inn Valley. It is divided into two parts, the "Oberstadt" (Upper Town) and "Unterstadt" (Lower Town"). Beyond that, there are various other small districts and hamlets associated with Imst. From the tourist′s point of view, Imst is a popular destination for rock climbers in the Eastern Alps. Nonetheless, it is less touristy than many other towns in Tyrol. The oldest settlement by today′s Imst can be tracked back to the Bronze Age. In 763, a town called "Opido humiste" was first mentioned in a document - the name refers to a local spring. Like most of the Upper Inn Valley, Imst was under Bavarian rule in the early Middle Ages. In 1266, Count Meinhard II of Tyrol purchased the town and surroundings and granted Imst the privilege to hold markets in 1282. Much of medieval Imst burnt down in a terrible fire in 1822. In 1898, Imst became a city. Today, the town prides itself to be among the cultural centres of Tyrol. Concerts and music festivals are held frequently, but at a closer look, most of the cultural endeavours of the town turn out to be of the rather provincial kind with big names visiting only if they also tour the rest of Austria. Traditional customs are more likely to appeal to the international visitor. This applies in particular to the customs associated with the "Fasnacht". The processions, songs, dances, costumes and lyrics of the Fasnacht traditions ("Schemenlaufen") are ancient and rooted in pagan traditions of the Alps. In Tyrol, there are three towns that are particularly famous for their Fasnacht activities: Imst, Nassereith and Telfs. Together, these three communities now form an association that collaborates on both promoting the event in the sake of tourism and preserving its original, genuine culture. To learn more about the processions that aim to get rid of the demons of winter and awake the spirits of spring, go to the "Widum" in Imst, a Baroque town house that was refurbished with much consideration and converted into a museum of the Fasnacht. The procession or "Schemenlaufen" itself is held only once every four years (2004, 2008 and so on). However, there are smaller events held on an annual basis. For traditional sightseeing beyond the Fasnacht Museum, do the usual walk around the town centre. The parish church at the Northern bit of the main road across Imst has some nice frescoes to offer and you can spot the odd burgher′s house in central locations. However, it is easy to see that most of the medieval heritage was lost (due to the fire mentioned above). A more interesting feature of Imst are the many fountains in the town centre: A total of 35, although only some 18 are historic ones that are worth noticing. A more significant claim to fame comes for the SOS Kinderdorf, which was the first of its kind worldwide. Hermann Gmeiner opened this community for orphans and children that needed care in 1951. Over the following decades, many Kinderdorf communities followed all over the world. As I have stated in the introduction to this article, Imst is a great destination for rock climbing. Beyond that, river rafting is organised in Imst, which is considered to be a great destination for outdoorish things in general. Hikers will enjoy the "Rosengartenschlucht" (Rose Garden Gorge) just outside of the town. Nearby attractions include the Ötztal, Seefeld and Landeck. All three of these destinations are relatively far away, though, so if they are your ultimate destination, Imst might make a good stop-over destination. Back to "Tyrol Sightseeing Guide"